• Frame Accurate capture at 2K and 4:4:4, uncompressed RGB, HD. • Automatic timestamps of captured files from LTC feed or RP188. • RS422, GVS9000VTR Controls, and TCP/IP. • GPI control from telecine controller. • Fibre Channel, or 10 Gigabit network, and dual Gigabit recording volumes. • Automatic embedding of Quicktime metadata for later identification. •Easily integrated solution for making Real Time footage automatically available on your network. Also available as a stand alone unit. Storage for viewing, editing, effects and finishing without having to transfer or format. •Media file is immediately available to post-production. •Save money on materials and time, creating your entire digital footage deliverable in the highest quality, using a fraction of the time and costs. •Uncompressed record with simultaneous, slow-mo playback while generating compressed proxy in full resolution. 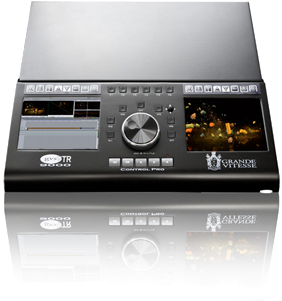 •GVS9000 VTR delivers the world of tapeless workflow. • Supports uncompressed SD/HD dual 3Gb/s with optional compressed codec to select format. GVS9000 VTR 2K Pro forms an excellent Telecine recorder for one-light transfers. It supports all the highest quality video capture, and variable frame rates. GVS9000 VTR 2K Pro connects to telecine controllers using a simple GPI switch closure interface, fed an LTC feed by the telecine system, which provides an accurate timestamp within the recorded movie, to ensure straightforward crash-record control. Alternatively, the unit can connect via GVS hardware option interface for pseudo-insert recording. In a color-grading setup, GVS9000 VTR 2K Pro provides an excellent, uncompressed, Dual Link HD recorder/player which is compatible with devices such as Pandora Pogle, allowing multiple uncompressed passes through the grader. It has been tested as a RS422 controlled player with DaVinci, Smoke, Lustre and Pogle system. For online storage, the GVS9000 VTR 2K is designed to work with the latest Nomadic and other Shared storage product technologies. Connect via fibre channel or 10Gbit to the Nomadic 12xPro, Nomadic 4U or GVS9000 VTR certified storage media. A complete solution from ingest, storage, edit to film in a single format with a wide range of post-production workflow options. The GVS9000 VTR 2K reduces the time required to capture footage and offers real-time playback at various speeds. Eliminate tape transfers using real-time technology without rendering video effects to disk. - The GVS9000 VTR 2K saves 2 HOURS of transfer time per hour of material, allowing audio/video post to immediately start working against new cut, while video is being captured. •Start editing in Final Cut Pro, Avid, or other editing applications while additional material is being captured. • GVS9000VTR 2K Pro Capture can perform very long captures without stopping, during which you can review, log or edit the incoming video and audio. 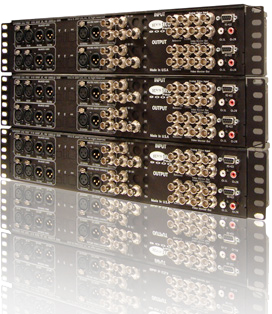 • GVS9000VTR 2K Pro offers synchronization of all the input and output ports. • Easy integration with remote control via third party controllers i.e. SonyP2, VDCP, and Odetics protocols supported by a number of manufacturers. • Multi machine lock immediately after pressing play, no slowing period, multi- machine synchronized playback as well as TCP/IP network interface. • GVS9000VTR 2K Pro can also be used for basic sub-clip logging, using a highly responsive 9000VTR Control jog shuttle controller. • Multiple sources of QuickTime ProRes, DPX, JPEG, DNxHD material can be played back in sync, without transferring to another medium like DVD or Tape. • GVS9000VTR 2K Pro configuration is extremely flexible, supporting almost any setup you may ever need. Sync to external TC, generate timecode, manual control with jog shuttle wheel, even run GVS9000VTR 2K units off a multi-machine Sony 9-pin synchronizer. • GVS9000VTR 2K Pro units can be easily ganged together for multi-camera environments, and automatic file naming and embedding of identification metadata makes life even easier for video editors. GVS9000 VTR 2K Pro recording is a discreet, timestamped QuickTime movie. The telecine controller can perform insert records (to start a timecode - fed crash record in GVS9000 VTR 2K Pro), you can use GVS hardware option 9-pin interface which presents a 'pseudo-insert capable' RS422 interface to your telecine controller, and converts this to crash record and LTC to GVS9000 VTR 2K Pro. By presenting Quicktime movies created in your video graphics department as a 9-pin controllable video deck, on air loading systems can upload material straight from GVS9000VTR 2K Pro just as if it were controlling digi-beta. Using this technique saves time and money since no transfers to tape are required, and there is no physical delivery from department to department. The video graphics artist no longer needs to have an expensive tape deck.